Anna Wintour has defended her choice to put Kim Kardashian and Kanye West on the cover of Vogue. This comes following reports that West begged the magazine editor to be put on the cover. "Part of the pleasure of editing Vogue, one that lies in a long tradition of this magazine, is being able to feature those who define the culture at any given moment, who stir things up, whose presence in the world shapes the way it looks and influences the way we see it," Wintour, 64, wrote in the issue's editor's letter, per Us Weekly. "I think we can all agree on the fact that that role is currently being played by Kim and Kanye to a T. (Or perhaps that should be to a K?)" "As for the cover, my opinion is that it is both charming and touching, and it was, I should add, entirely our idea to do it; you may have read that Kanye begged me to put his fiancee on Vogue's cover. He did nothing of the sort," she added. "The gossip might make better reading, but the simple fact of the matter is that it isn't true." Last fall, West told Ryan Seacrest that "there's no way Kim Kardashian shouldn't be on the cover of Vogue." The April issue is on newsstands now. 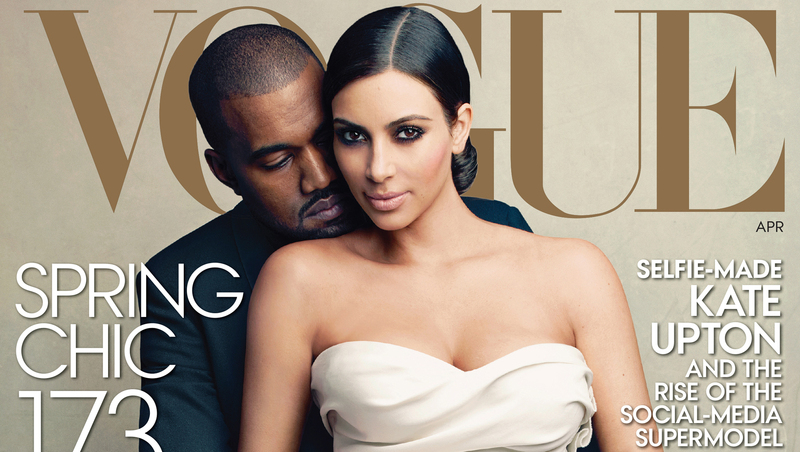 Tell us: What do you think about the couple on the cover of Vogue?